Plasterers Local 66 has received funding from the California Labor Federation and State Building & Construction Trades Council of California (SBCTC) to prepare journey-level workers for transitioning into the new Green economy. This funding allows Journey person plasterers to upgrade their skills in a revolutionary Green Interior Plaster wall finish made by American Clay Enterprises, Inc. This product can contribute up to 7 LEED credits on a project. The new product has no VOC’s, or off-gassing of chemicals. American Clay plasters are safe Interior Plaster wall finish made by American Clay Enterprises, Inc. This product can contribute up to 7 LEED credits on a project. The new product has no VOC’s, or off-gassing of chemicals. American Clay plasters are safe for the workers applying the material and for anyone coming into contact with the product after it is applied. Another feature of American Clay Earth Plasters is its mold resistant attributes. Test results have proven that American Clay Earth plasters do not allow for mold growth on the plaster surface. Journey person plasterers training on the American Clay Earth Plasters will commence in July 2009. The continued education of journey persons will take place at Plasterers Local 66 apprenticeship training facility. The hands-on education will also include LEED training and what can be done to keep the jobsite Green and environmentally responsible. As a result from application training utilizing American Clays Earth Plasters, Plasterers Local 66 craftspersons shall continue to offer state-of-the-art services to benefit contractors, property owners, architects, designers, Federal, State and Local governments. Plasterers Local 66 intends to continue its part for a Greener and safer world. As the demand for needed skilled crafts persons well versed in new and cutting edge “green” applications, Plasterers Local 66 has answered the call. Their sponsored Job Corps Pre-Apprentice Program is solidly in place, and is training young adults and at-risk youth a life-long profession. These young crafts persons are being taught the skills needed to provide high-end craftsmanship as demanded by the union plastering industry. 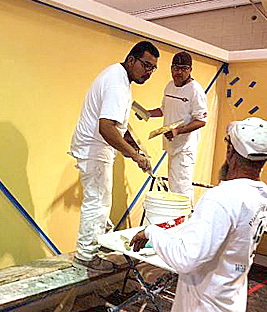 Plasterers Local 66 has been working with at risk youth for 8 years at the Treasure Island Job Corps and has provided them an opportunity to learn a career and make positive changes in their lives. The new green economy, along with American Clays Earth Plasters and Plasters Local 66 training will enable more young adults placed directly from the Job Corps into the Plasterers’ apprenticeship program. Plasterers Local 66 looks forward to working with Federal, State and Local governments, architects and designers to take advantage of the application of American Clay Earth plasters while utilizing a skilled and eager work force.